Jan. 21, 2015, 3:27 p.m.
By Caroline O’Donovan @ceodonovan Jan. 21, 2015, 3:27 p.m.
Facebook announced yet another tweak to the algorithm that governs its users’ News Feeds yesterday. The social network has introduced a new tool that allows users to flag a post as “a false news story.” The move follows a few other attempts by the platform to better delineate different types of content. For example, in August, it was reported that the company was experimenting with satire tags meant to help users differentiate between parody and news. They’ve also taken steps to push back against clickbait. FB relying on users self-policing to control spread of fake news. but doesnt viral quality necessarily mean many already duped? It would be an exaggeration to say that fake news sites have plagued Facebook, but links to stories containing false information meant to drive traffic do exist and can be misleading to readers across the Internet. Adrienne LaFrance, a former Nieman Lab staffer now a senior associate editor at The Atlantic, started a column called Antiviral at Gawker a year ago that was aimed at debunking viral hoaxes. She says users might not always find it as easy as Facebook expects to tell truth from fiction. Craig Silverman, a fellow at Columbia’s Tow Center, recently founded Emergent.info, a “a real-time rumor tracker” that “aims to develop best practices for debunking misinformation.” He’d reached out to Facebook before yesterday’s announcement in the hopes that they would take some kind of action against these sites that deliberately circulate false information. “What they really try to do is jump on things that are already in the news, or celebrities — stuff that has some level of consciousness in the public,” Silverman says of these sites. “They say, based on the story that’s already out there, what can we do that gets a reaction out of people?” Silverman keeps a list of around 16 repeat offenders — including The Daily Currant, National Report, World News Daily Report, Empire News, ScrapeTV, and more — which he sent to Facebook, knowing they wouldn’t blacklist the sites, but hoping they would take some sort of action. But users are also made uncomfortable by having attention drawn to their mistake, which can decrease interaction and engagement on the site. “By debunking this stuff, you look like a kill joy. You look like a know-it-all,” says Silverman. That finding has, naturally, influenced the way Facebook built its own anti-hoax tool “They don’t want to put up barriers to sharing, or create negative experiences for people who have done the sharing,” Silverman adds. 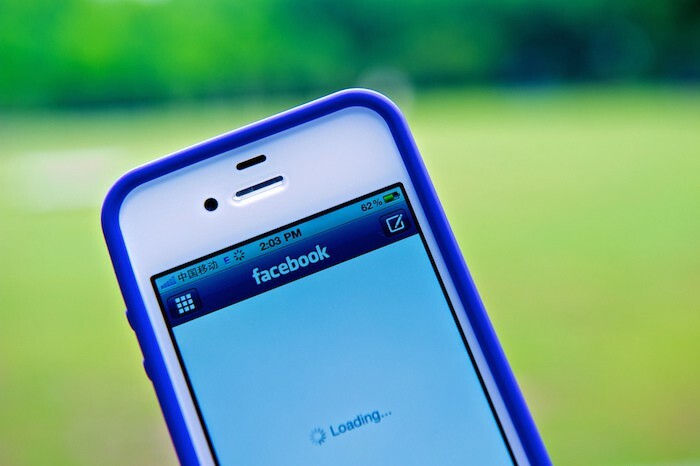 By introducing a crowd-based user tagging system that de-ranks hoax posts, rather than a more direct or aggressive approach, Facebook is attempting to maintain a sense of neutrality in the News Feed. Facebook's outsourcing fake-news detection to users seems more about preserving illusion of unfiltered experience than actual effectiveness. @markcoddington The thesis seems to be that human editing and curation is not to be trusted by readers. As if algorithms are neutral. 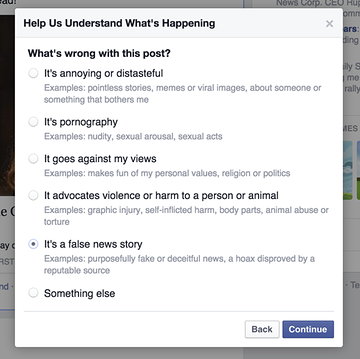 Facebook says the false news tag is just one in a suite of tools they use to guide its algorithm. But as long as they’re relying on automation, it’s conceivable that users could band together to abuse the tool. If the tweak works, that will be good news for publishers who won’t have to compete as directly with fake, viral stories. Facebook, long a big driver of news traffic, grew even bigger in 2014, with many Facebook users getting little news from other sources. Photo by Franco Bouly used under a Creative Commons license. POSTED Jan. 21, 2015, 3:27 p.m.
O'Donovan, Caroline. "What does Facebook’s new tool for fighting fake news mean for real publishers?." Nieman Journalism Lab. Nieman Foundation for Journalism at Harvard, 21 Jan. 2015. Web. 20 Apr. 2019. O'Donovan, Caroline. "What does Facebook’s new tool for fighting fake news mean for real publishers?." Nieman Journalism Lab. Last modified January 21, 2015. Accessed April 20, 2019. https://www.niemanlab.org/2015/01/what-does-facebooks-new-tool-for-fighting-fake-news-mean-for-real-publishers/.